Indian Social Forum Kuwait (ISF) highly appreciated the new amnesty declared by Ministry of Interior. This will help thousands of expatriates including Indians illegally live in Kuwait due to various reasons. ISF urged all illegal residents especially Indian citizens to utilize this opportunity either to legalize their residency or to leave the country as soon as possible. 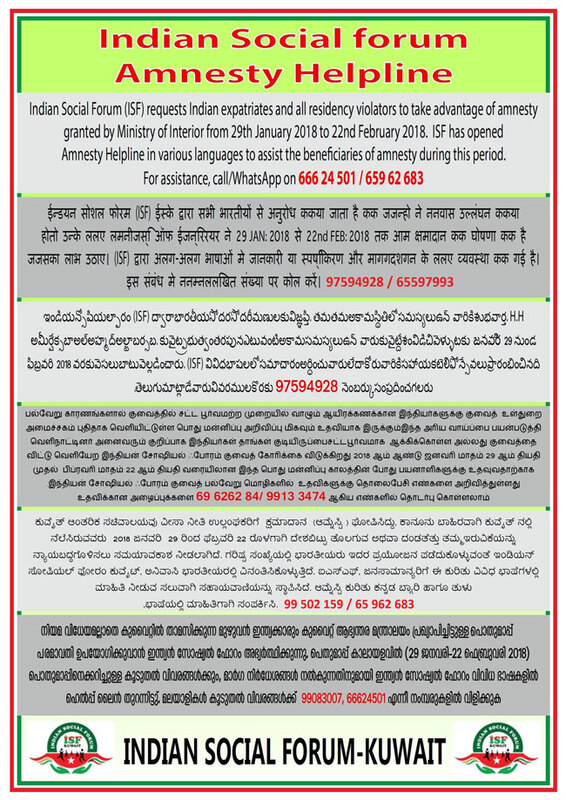 Indian social forum has opened Amnesty Helpline in various languages to assist the beneficiaries of amnesty during the amnesty period from 29th January 2018 to 22nd February 2018.